September 25, 2018 | Isaiah Bayas and Angelia Lowery, students from the Atlanta University, are working on practice technical interview questions. Photograph by KaiYanna Washington. In tech, we tend to hear a lot about the “pipeline problem,” the idea that truly inclusive hiring is hard to achieve because there simply aren’t enough qualified candidates to choose from. In my experience though, this framing doesn’t capture the problem. More often than not, what we’re talking about is a gap in access — not only to skills development but to the “right” experiences. There are plenty of amazing people to hire, but those people haven’t always been afforded the same opportunities as their peers, like internships at major tech companies or learning how to navigate the interview process. More often than not, what we’re talking about is a gap in access — not only to skills development but to the “right” experiences. 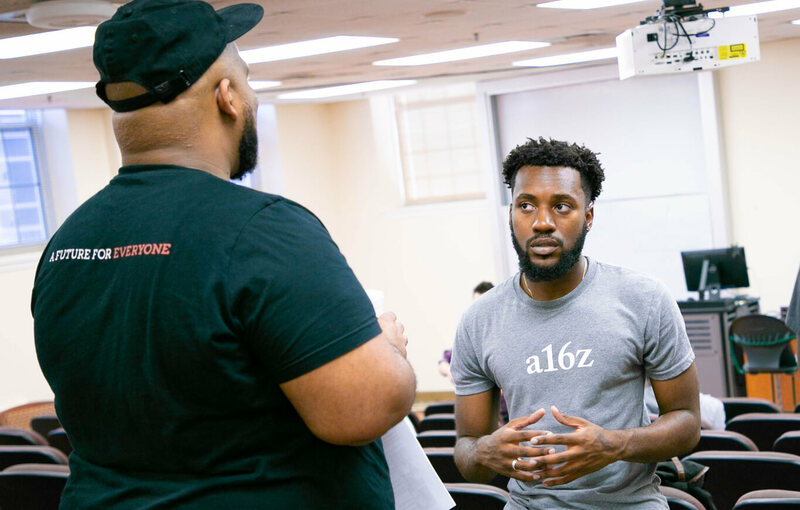 In September 2018, we launched a new pilot program in Atlanta, bringing together 70 computer science students from three of the nation’s most prestigious historically black institutions: Morehouse College, Spelman College, and Clark Atlanta University. Working in partnership with Karat, we hosted interview workshops and sessions geared to deliver real feedback, along with some first-hand perspective, to students considering a career in tech. Karat specializes in conducting first-round technical interviews, a service they offer to leading technology companies around the world. 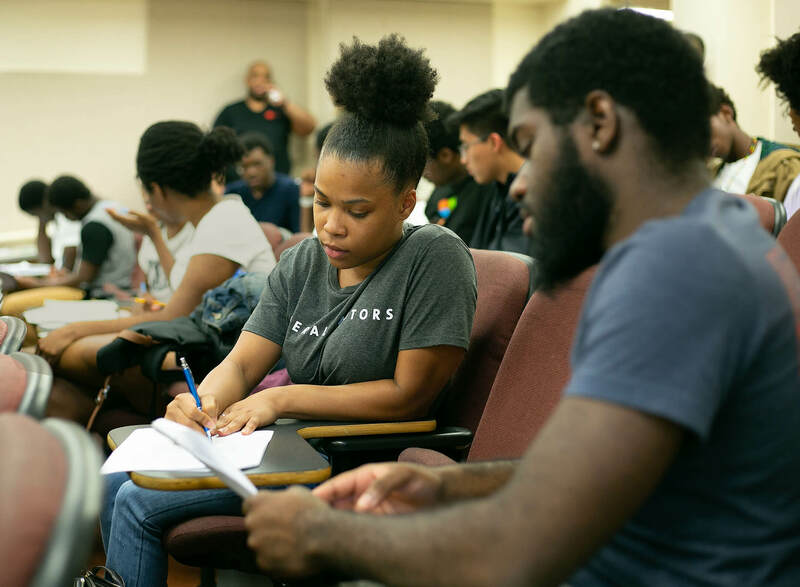 In September, we combined forces to host technical interview workshops at Morehouse in which students could ask questions, work through problems, and learn best practices. Later, students had the opportunity to sign up for individual interviews and receive feedback on how they’re doing, how they stack up with their peers, how to maximize their strengths and close gaps, if they exist. At the end of the day, at a small group dinner, I had a chance to reflect on my own experiences and answer questions from students. September 25, 2018 | Maurice Wilkins, Diversity, Equity, and Inclusion Manager is discussing careers in Silicon Valley, with Nashawn Chery, a student at Morehouse College. As a graduate of Morehouse College myself, the trip felt a bit like a homecoming, an opportunity to create some connectivity between my alma mater — a place that gave me so much, and one of the premier institutions in the country for supporting black students — and the broad realm of possibility at CZI and beyond. In my conversations with students, I fielded thoughtful questions — about my experience navigating the tech landscape, about their earning potential and the impact they could make — and watched as their eyes lit up. At its best, technology can be a tool for expanding one’s horizons and accessing opportunity. With efforts like this one, the hope is to give more young people a sense of the power they have to chart a new path.